The quasi-judicial board that rules on federal employees’ challenges to adverse personnel actions took a first step toward renewed relevance on Wednesday, as a Senate panel approved two of President Trump’s nominees to lead the agency. Those nominees will not receive final confirmation to the Merit Systems Protection Board, however, until Trump nominates someone for the third vacant slot. Trump had selected individuals to serve on all three slots of the panel, but the most controversial of them—Andrew Maunz—withdrew his name from consideration Tuesday evening. Sen. Ron Johnson, R-Wis., who chairs the Homeland Security and Governmental Affairs Committee, said at Wednesday’s vote the two nominees the committee approved will now sit in limbo until the White House puts forward a third name. MSPB lost its quorum in January 2017—and with it, its ability to render decisions—resulting in the largest ever backlog of cases before the board. For the last two years, Mark Robbins has been the lone remaining board member. He has been able to perform administrative and executive functions, but not act on any petitions for reviews of decisions made by regional administrative judges. Those judges have continued to issue rulings, thousands of which employees or agencies have appealed to the central board where they now are piling up. Robbins has continued to weigh in on the appeals, but nothing can happen to them until a new member is confirmed. Robbins’ term expires March 1, at which point his opinions would be thrown out. The committee was set to consider a measure that would have allowed him to sit on the board for one additional year, but Johnson opted not to take it up for a vote. In December, Trump appointed Robbins to concurrently serve as general counsel at the Office of Personnel Management. The committee approved MSPB chairman nominee Dennis Kirk and board member Julia Clark on a bipartisan basis. Only Sen. Rand Paul, R-Ky., opposed the nominees, noting his objection was not with the individuals but with the agency as a whole. 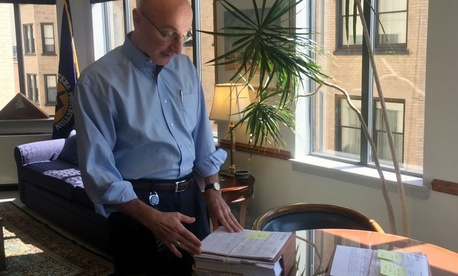 “Over time it’s kind of morphed into a job protection [board], not really merit evaluation,” Paul said, adding that it enables federal employees to keep their jobs when they would be fired in any other line of work. He further explained that Congress should allow MSPB to be rendered useless. Maunz, Trump’s third MSPB pick, withdrew his name this week after the controversy surrounding his nomination forced a delay to a scheduled committee vote in the last Congress. His previous service in the Social Security Administration’s general counsel office troubled Democrats and some board observers. Kirk and Clark, meanwhile, effusively praised federal workers and the laws that protect them during their confirmation hearings last year. The chairman-designate said MSPB should serve to “celebrate [federal employees'] service,” while Clark called civil service laws fundamental to a functioning democracy. Johnson said his committee will now work with the White House to secure a third nominee before the end of the month. Editor’s note: This story has been revised to remove information related to a suit filed against the SSA prior to Andrew Maunz joining the office.